Nostradamus did not only predict the end of the world. No, he also had a pif or a sixth sense for all things delectable and that certainly included using a touch of alchemy to create fruit confit, candied fruit. That same technique, one perfected by Olivier de Serres 400 years ago, has been used by five generations of the Lilamand family at their workshops in charming Saint Rémy de Provence since 1866. It involves simmering a peeled piece of fruit in a bain or bath of sugar syrup repeatedly over a period of three to four weeks until that mixture has replaced the water in the fruit. Then it is left to rest for at least two months to complete the candying process. The result is truly spectacular. Miraculously, with each yielding bite, one tastes only the pure essence of the fruit itself - and this comes from someone who can't stand sugary sweets! But fruit confit? Most certainly - especially after it has been taken through the final step of glaçage - a skillful icing that almost makes the fruit look as if it has just been picked. Yes, your fingers will be just ever so slightly sticky afterwards, but it will be worth it. 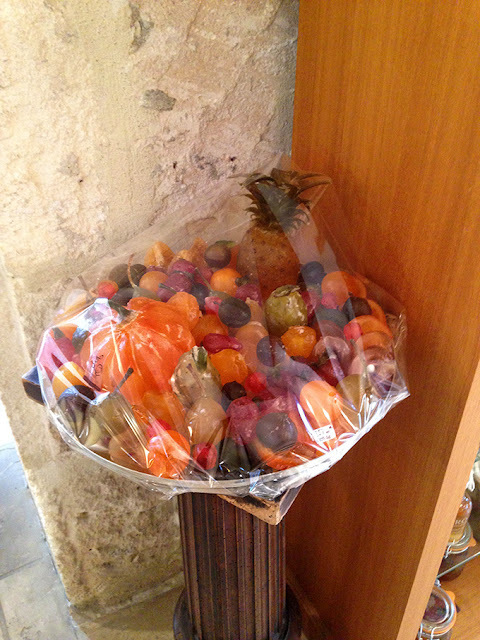 And I especially love that all of the fruit used is local and some - such as the tangy cédrat - are exemplary of the unique offerings in Provence. These photos were admittedly taken in haste and don't begin to show the beauty of what Lilamand Confiseur does - think edible jewels. 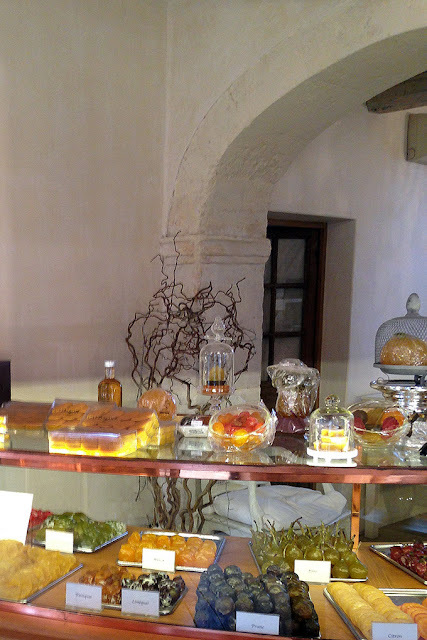 In their elegant boutique, they offer quite a range of products (that also make perfect gifts) from exotic platters costing several hundred Euros (such craftsmanship does not come cheap nor should it), to tasting boxes starting at 15 Euros and a selection of "seconds" that are perfect for baking. In the past few years, the company has also started baking their own calissons (and they are delicious, take that Aix-en-Provence), jams and fruit syrups. 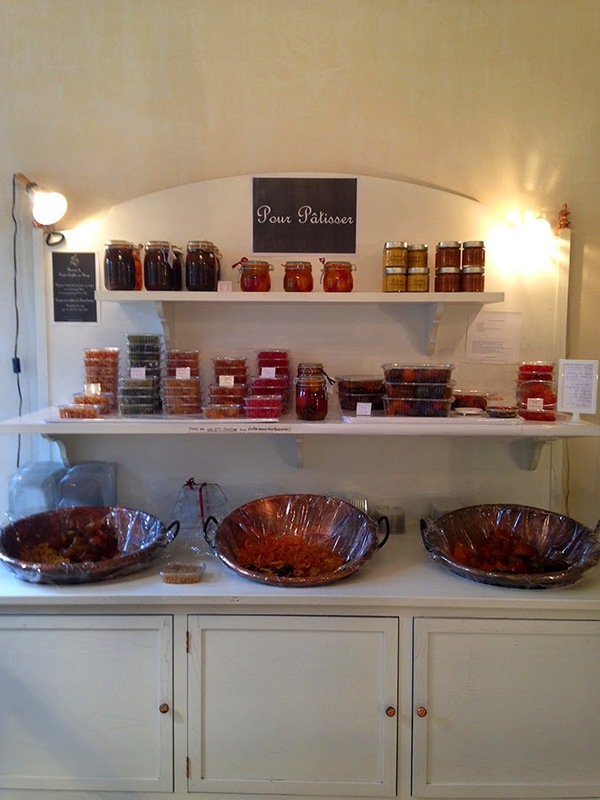 While there is an excellent on-line boutique, I specifically wanted to mention this company for those of you who will be visiting Provence this summer so that you can go and visit for yourselves. Annabelle welcomed us warmly (yes, she speaks English) and was patient in explaining the process involved, making this exquisite delicacy quite approachable. While I tend to associate Nostradamus with doom and gloom, I certainly am sending a merci back through the centuries for his forecasting the success of fruit confit...quite a discovery. Both boutiques are closed on Monday. And to visit their online shop, click here. I remember the glaced fruits in Paris. Quite beautiful. I have an old recipe of Nostradamus. Seems he used to be many things besides a seer. I think I will name my next ROOSTER NOSTRADAMUS..........I like the sound of it! Looks delicious........don't think I have EVER had the PLEASURE!Must change that! Now that, my dear Contessa, is positvely one of the best ideas I have ever heard! Imagine with what importance he will declare the opening of a new day!!! And yes, you definitely need to change that by booking a plane and coming to see me this summer (with a side trip to Paris as well)! 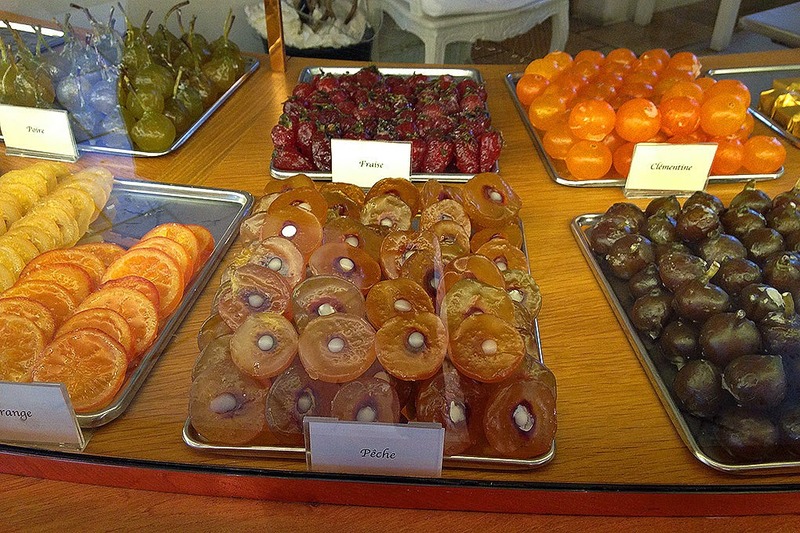 My husband would adore the candied fruit. I prefer it in its natural state. The store itself looks really pretty and welcoming. They fairly glow with light. Elegant is a great descriptor. I can't imagine how wonderful they would taste. I don't have a sweet tooth, but I'd love to try one of these. Thanks, Heather. A really interesting mini tour! Imagine being given that huge mixed basket! You'd have them for months! But I guess they keep forever, so it wouldn't matter. Very spectacular! Deb, those baskets were so beautiful that it almost hard to imagine eating them...I said almost! 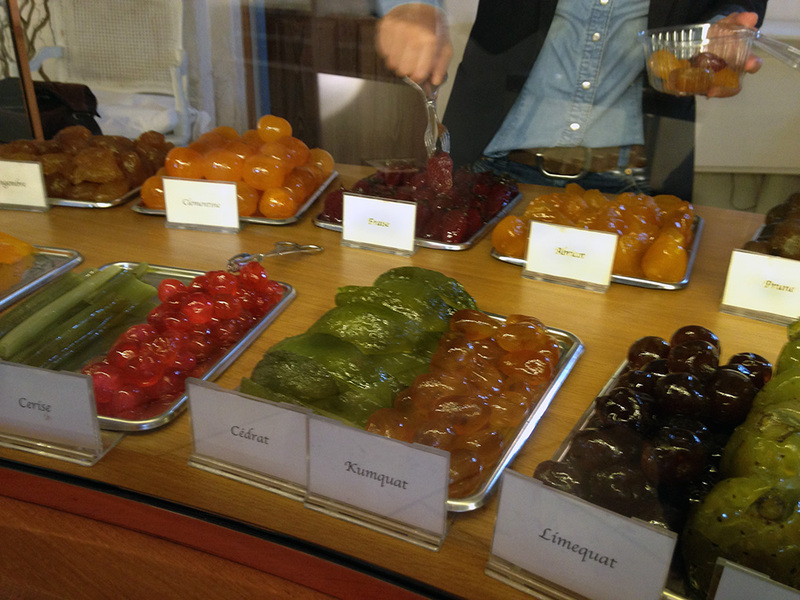 I remember seeing a beautiful display of candied fruit at a stall during a Christmas market in Toulouse. I didn't buy any because I assumed they would be too sweet, but now that you've explained that it tastes like the essence of the fruit I will simply have to return to France and buy some! I so appreciate the French attention to detail and process in order to make things both correctly "comme il faut" and beautifully. The results are both aesthetically pleasing and delicious! Thanks for sharing. Not something I have tried but I would love to. 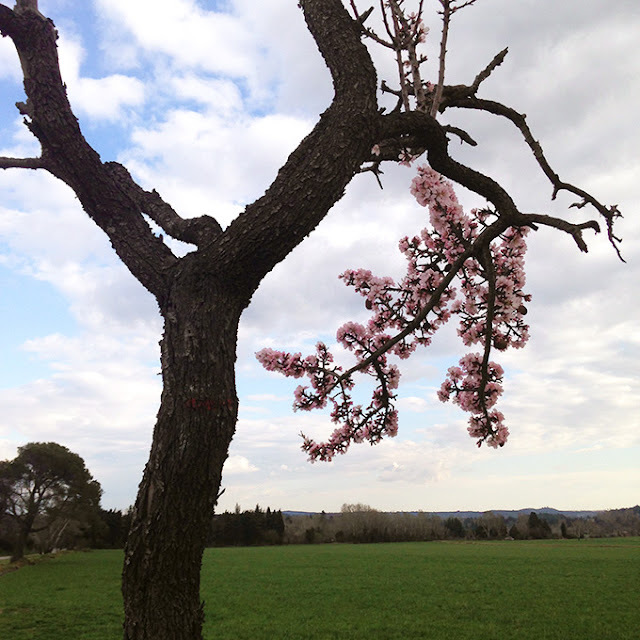 G, they are you to a T.
A beautiful gift from Provence to Paris. Thank you Heather. I hope that you enjoyed them! I honestly think that I never would have gone to their shop if it wasn't that I absolutely needed to buy a tiny bit for you. First: La Contessa is my hero - a rooster named Nostradamus??? LOVE THAT! But, yummmm, those fruity treats look SO delicious!!! I can't believe they take months to make - you're right that they should be priced accordingly! Did you taste many? I also love the colors - it all looks wonderful! Love the tree, too - le sigh!!! Sister, La Contessa is truly someone who could be everyone's hero! She is one of a kind. And I did get to taste a bit both at friend's houses and because of the kindness of at the shop. I think you would love it and we will go next year!!! Well then? Please come to visit! Edible jewels indeed! These look and sound divine. Elegant enough even for you, belle D.
I pile these delectable jewels on top of layer cakes, sans frosting. So pretty. So delicious...just like your photography and prose. Sweetly expressed and blessed with sweetness. There are certain things in life that are very hard to refuse, fruit confit is one of them. Mrs. Abstract will toast to that. Gorgeous! Not only beautiful to look at, but jewel like when used as decoration of cakes, or arranged together with luscious French cheeses for a cheese course. Ooh, I love the cheese course idea. Brilliant! I remember the Angelica from Lilamand. It was absolutely delicious. Didn't make it to St. Remy during our May visit since the Transhumance ended up being a week later this year than what I had thought. 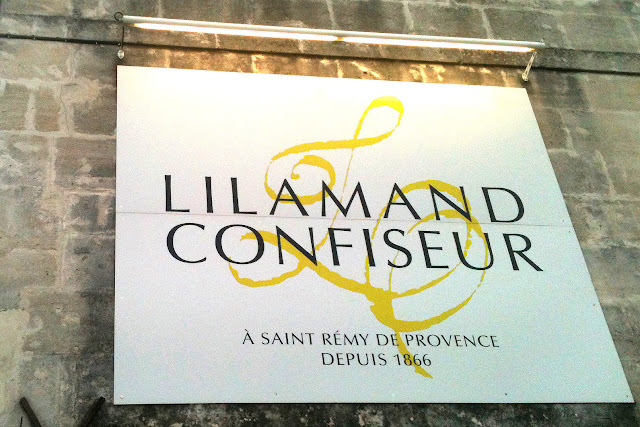 I will look for the Confiserie Lilamand boutique when we return in October. I hope you have a great summer. I still hope we can meet up some time.